Question: Is one permitted to write “ב"ה” (acronym for “Be’ezrat Hashem”) at the top of letters, adorn wedding invitations with verses, and the like or should one not do so out of concern that they may be thrown out into the waste basket, causing disgrace to Hashem’s name? Answer: The Gemara in Masechet Rosh Hashana (18b) tells us that once, the evil Greek sovereignty decreed that the Jews not mention Hashem’s name on their lips. When the Hashmonai family defeated the Greeks, they established mentioning Hashem’s name even in mundane documents and contracts, as follows: “In such-and-such year of Yochanan, the High Priest of the Almighty G-d.” When the Sages heard about this enactment they said, “Tomorrow the borrower will pay his debt and this document (which bears Hashem’s name on it) will be thrown in the trash.” They then proceeded to nullify this enactment and this day was turned into a holiday. This means that, originally, the Greeks decreed that the Jews not mention Hashem’s name anywhere, neither verbally nor in writing. Therefore, when the Hashmonai family triumphed over the Greeks, they established that the name of Hashem be cited in all letters, even mundane letters that were not Torah-related at all, for instance, in contracts of loan and the like. The way they used to mention Hashem’s name was by marking the present date as however many years they were into the priesthood of Yochanan, High Priest of the Almighty G-d. In this way, Hashem’s name was mentioned in deeds and bills. Later though, when the Sages saw that this enactment was causing obstacles in that people would throw their documents into the trash after they repaid their debts which would cause disgrace to Hashem’s name, they decreed not to write Hashem’s name in documents. 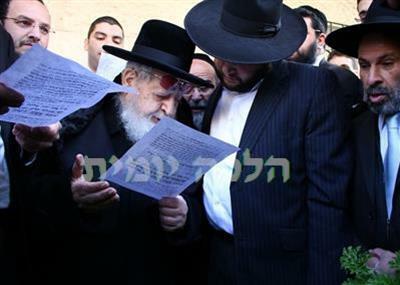 Maran Rabbeinu Ovadia Yosef zt”l derives from here that one should not write verses and the like on documents, invitations, and the like, for these things are usually thrown out and, in this way, things which halachically require Geniza (burial of sacred objects) will, G-d forbid, end up being disgraced. Therefore, the students and followers of Maran zt”l customarily do not write the verses of “Kol Sasson Ve’Kol Simcha” or “Im Eshkachech Yerushalayim” and the like on wedding invitations, for doing so would create a problem of throwing such invitations out since they would require Genizah according to Halacha and most people are not careful about this, thus causing disgrace to Hashem’s name. However, regarding mentioning Hashem’s name through an acronym, such as ) ברוך ה'the "ה" being short for “Hashem”) and the like, one need not be concerned about any prohibition. Similarly, Maran Ha’Chida writes in his Sefer Berit Olam in the name of Rabbeinu Eliezer Nachum zt”l that one who writes the letter "ה" with the intention of it serving as Hashem’s name (as is customary today) may in fact erase this letter and one need not worry about the prohibition of erasing Hashem’s name. We see clearly that writing one letter that only represents Hashem’s name is neither included in the prohibition of erasing Hashem’s name nor in the prohibition of disposing of it. Although there are those who rule stringently and write that one should not write ב"ה on one’s letterhead, nevertheless most people customarily act lenient regarding this matter. On the contrary, we find that Hagaon Harav Yitzchak Karo writes that it is customary to write ב"ה at the beginning of one’s letters based on the verse, “In all your ways know Him (Hashem), and He will straighten your paths.” We see that not only is there no prohibition involved, there is even a Mitzvah to mention Hashem’s name in this way in every letter a person writes. Maran zt”l rules accordingly in his Responsa Yechave Da’at (Volume 3, Chapter 78). Summary: Although one should refrain from writing verses that would require Geniza (sacred handling) on mundane documents such as wedding invitations and the like, nevertheless, one may write Hashem’s name in acronym form, for instance ב"ה and בעז"ה (“Baruch Hashem” and “Be’ezrat Hashem”). On the contrary, this is a righteous custom observed by many great people.